A cheque was presented to the March of Dimes on behalf of the Members of the Sudbury Real Estate Board from the REALTORS Care® Foundation. Accepting the cheque on behalf of the organization was Deanna Chisholm-Tullio, Regional Independent Living Manager. Presenting the cheque was 2017 Sudbury Real Estate Board Interim President Caroline McDonald. 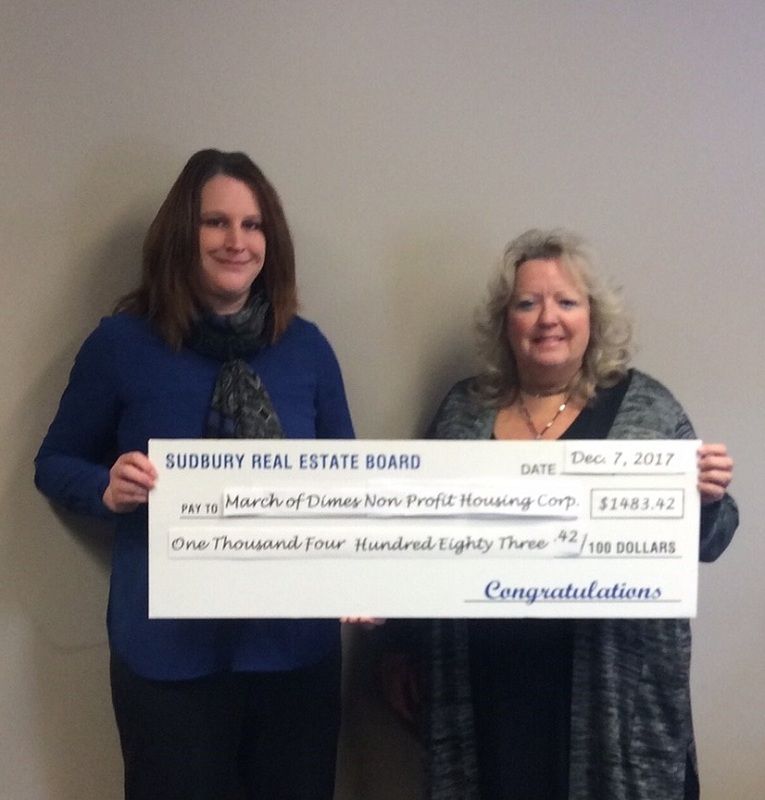 “We are grateful for the support of the REALTORS Care® grant through the Sudbury Real Estate Board over the past 2 years, that assists March of Dimes Canada to continue to enhance the lives of those living with a brain injury. Experiencing a brain injury can impact one’s physical, cognitive, social & emotional skills and the ability to perform daily tasks we often take for granted. The funding provides the opportunity to enhance the home environment with the purchase of rehabilitation equipment and resources which aims to enhance the quality of life for individuals residing in our setting. It also assists in regaining skills altered as a result of their brain injury and realize one’s potential. Thank you to the members of the Sudbury Real Estate Board on behalf of March of Dimes Non-Profit Housing Corporation for the on-going support of our vision to provide affordable and accessible housing to those with disabilities.